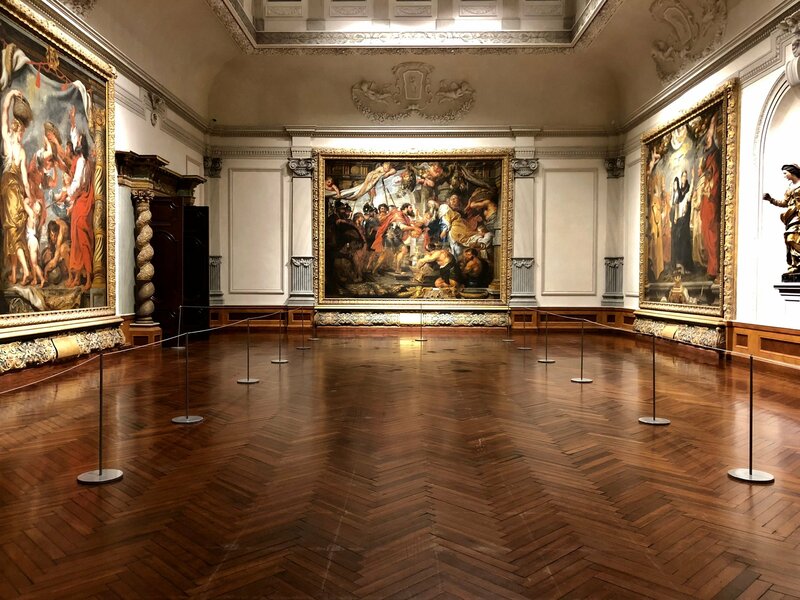 The original hardwood floor in Gallery 2 of the John and Mable Ringling Museum of Art has long been in need of major restoration. This work began in early January, 2019, and will continue into April, during which time Galleries 1 and 2 will be closed to the public. But these are no ordinary floors. The Rubens Triumph of the Eucharist series is the cornerstone of The Ringling collection, and Galleries 1 and 2, designed to showcase these monumental artworks, are a physical cornerstone of the Museum of Art. 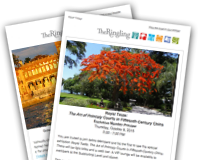 When John Ringling purchased the series from the estate of the Duke of Westminster in 1926, it is fortunate that he not only had the funds to purchase these works all together, but also as he was building his museum he had the ability to design a gallery of epic proportions to display them. 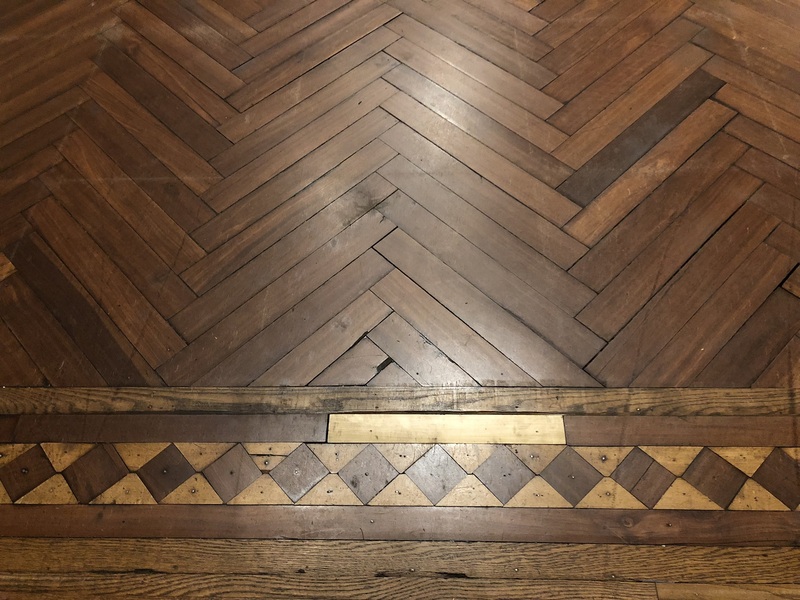 The floor of Gallery 2 is an exotic tropical hardwood species from the Manilkara genus, cut into slats that are assembled in a herringbone pattern, with a parquet pattern of this wood combined with oak and maple around the border. Apparently, adjacent floorboards would have normally fit together tongue-and-groove, but a letter on record states that the wood was so hard that, when the workers tried to cut it, it broke the blades of their milling machine.” So the square-edged boards were all adhered to the subfloor, one by one. Over the past 90 years since the Museum opened to the public, the mastic adhesive has weakened and many of the floorboards have become detached. This potential trip hazard to visitors has been mitigated by nailing down boards, applying new adhesive, putting down rugs, or roping off the affected areas. Finally, even though it meant closing these popular galleries for a 2 month period, it was time for a proper restoration of the floor. 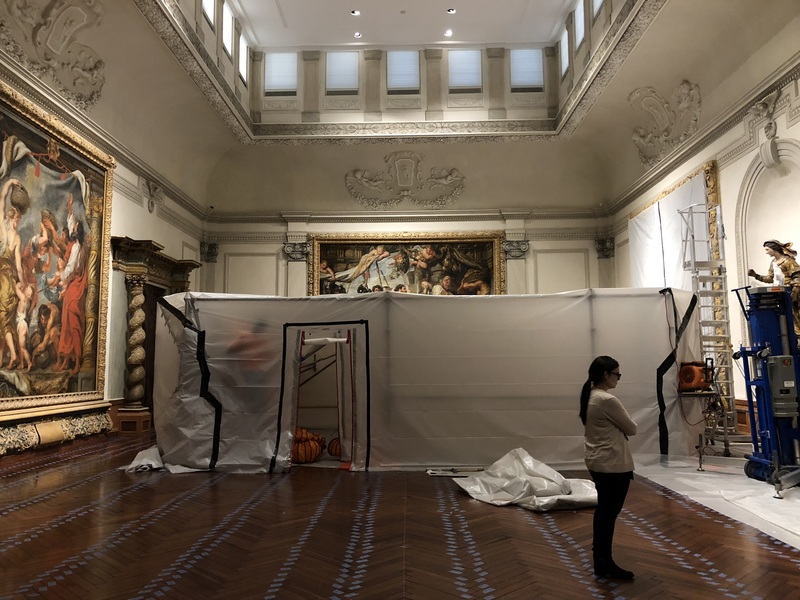 Barbara Ramsay, Chief Conservator for The Ringling, explained that specialized conservators have been contracted to carry out the restoration work: Conservation Solutions Division of EverGreene Architectural Arts. The first step in the process was to conduct a thorough visual examination, which included numbering and photographing almost 5,000 boards so they could later be replaced in their original locations. The floorboards are being removed and the subfloor is having mastic adhesive mechanically removed. The artwork in the gallery had to be covered carefully, and a tent was erected inside the gallery to contain dust. The original adhesive is extremely difficult to remove from the original floor boards. A tent erected outside of the museum is where conservators can safely blast the underside and edges of each board with dry ice, and then the super-chilled adhesive can be scraped off and the board can be further cleaned. An adhesive specifically tested for this project will be used to reattach the cleaned boards to the subfloor. 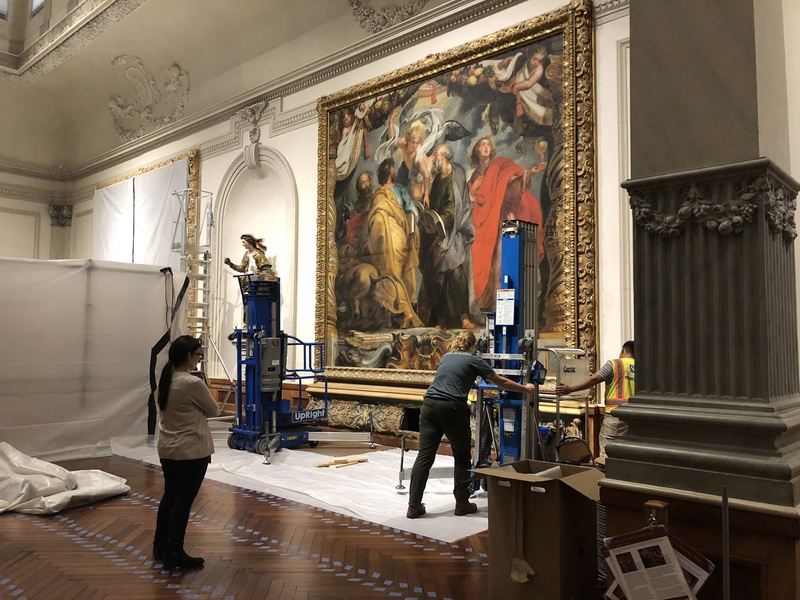 Barring any unexpected developments, the conservation work is slated to be completed in April, 2019, at which time the Rubens galleries will reopen to the public. As with many of the conservation and restoration projects at The Ringling, we are fortunate to be able to preserve the original materials and the original design of the galleries for our visitors for many years to come. In the meantime, you can find more Rubens from The Ringling collection on view in Gallery 11, or in our online collections.